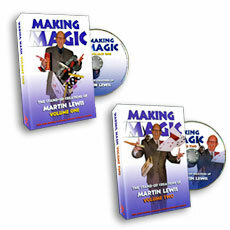 Each Martin Lewis DVD features six strong, audience tested, stand up effects plucked from his own Cabaret act. Martin shows you, in a step-by-step hands on guide, how to make the "props" on your kitchen table quickly and easily with only basic tools and materials and needing no special skills. Then, in live performance, see how the apparatus is used to really make magic. In this version of the classic "Torn and Restored Napkin" two different colored papers are used to explain how it works... But the audience is still no wiser. At the end it seems like the magician stabs the wrong card, but instead ends up with a visual knockout! A spectator slowly names the card that the audience is thinking of by gazing into a crystal ball. Martin's method is as amazing as the effect. The "Three and a Half of Clubs" is taken from being a close up gag to a brilliant stand-up routine. Along the way Martin shows a great way make giant cards. Show the front and back of your hand slowly and produce a fan of cards. Absolutely no manipulation required. The title tells all. Martin's presentation of an effect created by Harbin. This is a real fooler, and a closer in anyone's book. Worth it for the card vanish alone!